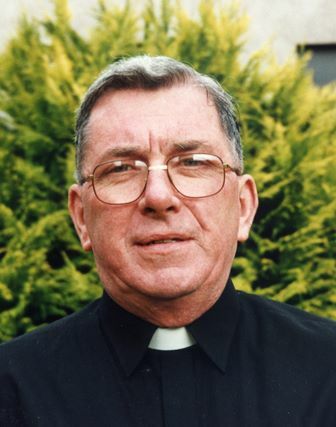 The funeral Mass for Fr Michael Darcy SMA took place in St Mary’s Catholic Church, Swanlinbar, Co Cavan at 11am on Monday, 13 May 2013. Fr John Dunne, SMA Provincial Leader, was the Principal Celebrant and preached the homily for the Mass, drawing on readings from Isaiah 25: 6-9; Romans 14: 7-12 and John 14: 1-6. Since Fr Michael died in Cork on Friday last many people who knew him spoke about him and how they remembered him. I am sure it was the same for you, his family and friends. Everybody loves to be remembered. But if we want to be remembered we have a duty to remember. Memory is a powerful gift and rightly used it is a form of immortality. It keeps the past alive. Those we remember never die; they continue to walk and talk with us. Their influence can still be felt among us. There is nothing better or more helpful than a good remembrance. Jesus asked his disciples to remember when at the Last Supper he said “do this in memory of me”. Our Mass today is our response to this invitation; it is one key way of remembering Jesus who is our Saviour. Death is inevitable; it is the gateway to our true home. However, to face our own death is not an easy thing. When a loved one died we are left with a real emptiness and the pain of loss and loneliness. So we need a context or a way of remembering those who pass from our sight to a new way of being. As Christians we are blessed to have the Word of God to guide our remembering. With the readings chosen for our Mass today we can put the life and death of Fr Michael – and our own too – into context and this then allows us to mourn, to remember and to give thanks. The first reading is from the ancient prophet Isaiah. It speaks to us of a promise which was made to our people thousands of years ago. It is message of hope which uses the image of a banquet; it is inclusive as it speaks of all people; it tells of God doing something for us – removing the mourning veil – and not us trying to win something or achieve the impossible. This allows us to accept our failings and weaknesses in the context of a belief that God will destroy death; he will wipe away tears and take away our shame. Those who die in faith will say, “see this is our God in whom we hoped for salvation”. Fr Michael together with all our deceased will say, “we exult and rejoice that God has saved us”. Our second reading is a wonderful reminder. It grounds us very quickly as it highlights the importance of our lives, no matter who we are or what we do. Sometimes people live thinking they are not important or saying to themselves ‘sure I don’t make any difference to places or people’. Sometimes we defer to those we consider powerful or important and thereby deny our own unique importance. St Paul was not slow to point out time and time again that the life of each one of us has its influence on others. He wants us to live with this awareness. If we choose to do this we will make a difference to our world. The issues of the day are ours and must not be left to the few to decide. We must take responsibility for our world and how it is; all of us – yes, you and I – are the ones who make it as it is. We can choose to engage or not to get involved. But either way our choice makes a difference. We choose to have a good or a negative influence. And it is to God that each of us will have to give account when life’s journey is over. The Gospel for today’s Mass is the lovely story of Jesus inviting people like us who may be worried, broken hearted or burdened in any way, to trust in God and in himself. He wraps this invitation in the story of the Father’s house; in My Father’s House… there are many rooms and among them a place for you and for each one of us. This image is similar to the one of the banquet of rich food in the first reading. Not only does He invite us to trust but He gives us good reason for doing so when He announces, “I am going now to prepare a place for you and then when I have gone and prepared you a place I will return to take you with me so that where I am you may be too”. Then He goes on to say “I am the way, the truth and the life”. He assures us that we don’t have to find our way alone; it is not a question of us struggling to find the way through some obscure, well-hidden path at the risk of getting lost and frustrated in our efforts. No, it is much more like a gift; it is something offered to us by the One who claims to know the way because he made the journey himself and who now wants to be our companion and guide on the journey. Michael Darcy was born nearby on 2nd October 1933. He was ordained a priest in the Society of African Missions on 21st December 1960. He ministered in Nigeria and in Ireland for over 48 years. He was retired for the last 4 years in Cork. And he died there on 10th May 2013. This is Michael’s life in summary. But for us and those who knew him well there is a much larger story, which is made up of the events of his early life at home in Dromconra with his parents Con and Celia and his two brothers, Con and Philip. Then there is the period of his adolescence and secondary education at Ballinafad College, Co Mayo, followed by his entry into the SMA and his studies in preparation for ordination to priesthood. This is followed by the story or stories of his life in Nigeria where he served for 27 years working as a missionary priest in the Diocese of Jos, northern Nigeria and finally his years of ministry and retirement in Ireland. In Africa he ministered in parishes like Jos, Shendam, Pankshin, Kwa and Bukuru. When Fr Michael arrived in Nigeria the church was still in its infancy in the north of Nigeria. This brought its own challenges; life was not so easy for the early missionaries as they coped with the issues associated with developing structures and programmes for the formation of new and young Christians. But the work was blessed and so the church grew and began to flourish. Churches, schools and medical facilities were built. Missionaries worked with the local people and their catechists to spread the Good News and so today the fruits of their labours can be seen in a strong vibrant self-supporting church. The former diocese of Jos is now an Archdiocese and four other dioceses have been established from and through it. Politically, Nigeria had its own share of struggles which resulted in the 1960s in a civil war. The impact of this was acutely felt in the north and especially in the Diocese where Fr Michael worked with other missionaries. He was then working in a parish in Bukuru where many lives were lost. He stood firmly by those who were threatened and saved the lives of many as he put his own life at risk by ferrying them to train, bus and lorry stations to get transport so that they could return to their own home towns. It was a difficult time for the people and for the missionaries. The church suffered many casualties; some communities were almost wiped out. But it was also the beginning of another era in the growth of the local church. The growth of the local church means missionaries work to replace themselves. In Jos and the surrounding areas the local clergy began to grow as it was blessed with new members and with vocations to priesthood and religious life. Communities grew gradually but steadily. In this process there is call for the missionary to let go and make place for local people. This is always a delicate challenge; it is about knowing the right time and the best way to make the transition. Fr Michael was part of this process in Jos when it had its own Bishop and growing numbers of local vocations. He loved his work there and was rightly sad when the time came for him to move on having handed over the others. Each person is called to use one’s personal gifts for the good of all. Michael had his own unique gifts which he put at the service of others during the 53 years of his priesthood, 48 of which were spent in active ministry in Nigeria, in the Diocese of Cork & Ross and in the Archdiocese of Tuam. He loved his years in Louisburg. Michael was a quiet man and not always full of confidence. Being a missionary quickly identifies one’s Achilles heel and so one is called to face the shadow side of life. While blessed with good health Fr Michael who had his own gifts for ministry also had to deal with a personal problem around alcohol. When he accepted this and got professional help he spent a good number of years enjoying sobriety. He wrote that this was a grace and a blessing that came from the higher power. He was ever grateful for the gift and thankful to those who supported him in his struggle to find the right path. This was one of the last things he wrote. We can now see the importance of the Word of God which tells us that with God all things are possible, that our lives do have an impact on others and that our shame will be wiped away. When all is said and done, when life’s journey comes to an end we depend ultimately on the mercy of God from whom our salvation comes. Rising from the dead, Christ became the light that illuminates all peoples, that lightens and saves the path of humanity and allows us to catch a glimpse of God’s eternal kingdom beyond the tunnel of death. Christians, who have been marked by the seal of the Holy Spirit, are the enlightened ones. Dying with Christ they rise again with Him in the dazzling light of the Lord’s Day, of the new creation. They are new creatures, they are like the stars and they have a mission to illuminate the dark and often tragic path of history. Fr Michael has now joined them and he shared in that new mission. So we say eternal rest grant unto him O Lord and may perpetual light shine upon him. Ar dheis lamh De to raibh a anam dílis. Read an Obituary of Fr Michael Darcy here.